Star Trek encouraged us to boldly go where no man has gone before. 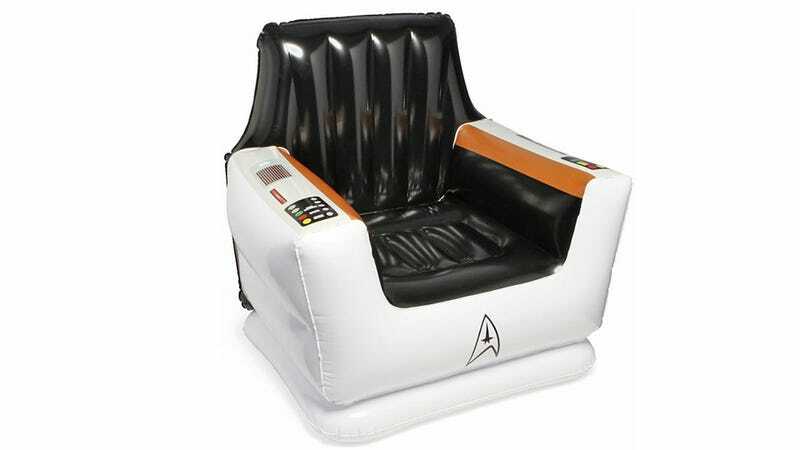 And as long as that's no where near a thumbtack or a safety pin, you can do so in comfort and style with ThinkGeek's new inflatable Captain's Chair. It's an officially licensed Star Trek collectible, and for just $25 it includes authentic button and light graphics for pretending to declare a red alert, or firing photon torpedos at incoming beach balls. Just keep in mind it can only support about 120 pounds. So while the original series Kirk might have been able to use it, the more rotund version of the captain seen in the Star Trek movies wouldn't stand a chance.